Sarah Stone's "Bijou" dress handsewn by Margaret Ann, Patsy's daughter, for her daughter Emma. She used a combination of beautiful Swiss and French laces and tatting to creat the fancy band and flutter sleeves. Fabric chosen is the finest swiss batiste, Bear Threads robin's egg Barissima II. Laces were tea-dyed for depth of color.This has quickly become the signature heirloom dress of The Sewing Room! Precious Emma on Easter morning. 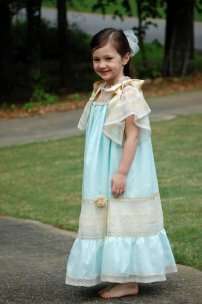 (It is tradition here in the South that children have bare feet when wearing these heirloom garments.) This is one of those wonderful patterns that a child will get many years of wear out of... Emma is wearing it here to the ankle, and as she grows it is still appropriate for it to be shorter. 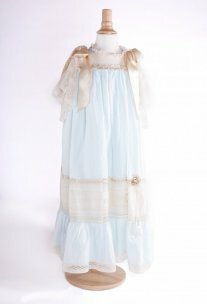 The absolute perfect Easter, portrait, and/or flower girl dress. Welcome to our Idea Gallery! Here are a few samples we have in the store of things we have made over the last several years. 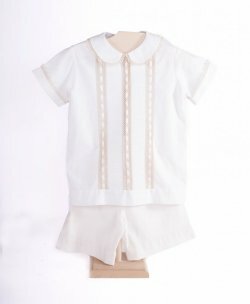 We hope to inspire you to create beautiful garments for your children and grandchildren.We teach many classes, offer garment construction for those that do not want to sew, and LOVE to assist you in choosing the perfect fabrics, patterns, laces, etc. for your next project. Let us know if there is anything we can do to help you!